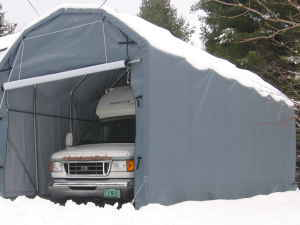 As fall leads into winter those of you who are the privileged owners of an RV will be thinking of garaging your vehicle for the cold winter months to protect it from the elements and to keep it in good shape for the next season. We all know too well by leaving your vehicle out over winter will do it no good. The accumulation of dampness over time will cause problems with electrics, air condition etc. and not to mention causing it to rust and deteriorate faster, thus reducing its lifetime and dependability. So here are a few simple tips to consider when decommissioning your hobby home for the winter. Remove the batteries before storage. If you leave the batteries installed and plugged into the power supply for a long period of time. This can cause overcharging the cells in doing so deplete the electrolyte. It is better to remove the batteries and store them in a dry shed or garage. It is not advisable to start you vehicle over the winter when it is in storage as this can cause moisture deposits in the exhaust system and in the crank cast which can form acids and sludge. It is advisable to change the oil and filter before storage. As fuel deteriorates over time it might be a good idea to pour a fuel storage stabilizer additive into the tank or if possible to remove the fuel altogether and just leave a small amount to keep the lines full. Another tip if leaving your RV outdoors over winter is is to park the wheels on blocks of wood or concrete slabs and cover them with plastic. This will preserve your tires from UV deterioration. RV’s can be a safe home for rodents over the winter as they can crawl into the engine and other compartments & make a little home for themselves. Sometimes they can eat rubber hoses and do lot of damage in the process. Before commissioning your RV it will be necessary to give the underneath and engine a thorough inspection for any such damage. Cut costs and save dollars; a tip re saving some money. Provided your RV is parked on private property and depending on your insurance policy it may be possible to cancel parts of the policy like collision, medical and uninsured portions of the RV’s insurance policy until you are ready for the road again. It is important to keep the comprehensive part of the policy active for peace of mind and your financier with require it be insured. Interior; Defrost your freezer and clean the refrigerator and when done leave the doors open. Also advisable to leave all cabinets doors and drawers open to avoid dampness or mould accumulation. Disconnect any gas supplies and electricity. Service all door locks with some spray oil. If you follow all these tips it will be hard not to contemplate a method of housing your motor home in a professional storage shelter. Here at storage sheds direct we carry a neat range of economical professional RV shelters made by the tried and trusted brand Rhino Shelters. We also offer toll free customer support and advise on all our products. 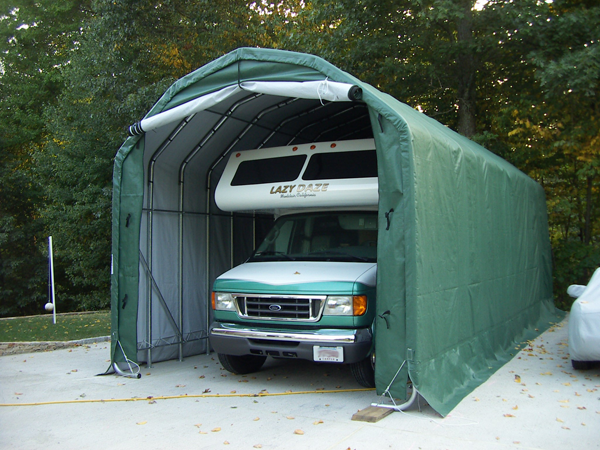 Check out our RV Storage Shelters and batten down the hatches this winter with peace of mind that your RV is stored safely and protected from the harsh winter elements. This is some really good information about what to do with an RV during the winter. My parents are considering buying an RV right now even though it is cold. That way, they can get a better deal on one. So I liked your advice about how it would be smart to disconnect the gas line before they put it in storage.